A “very gutted’’ Karrie Webb could not cling on to win the Ladies Scottish Open but did log her best result of the season at Dundonald Links. 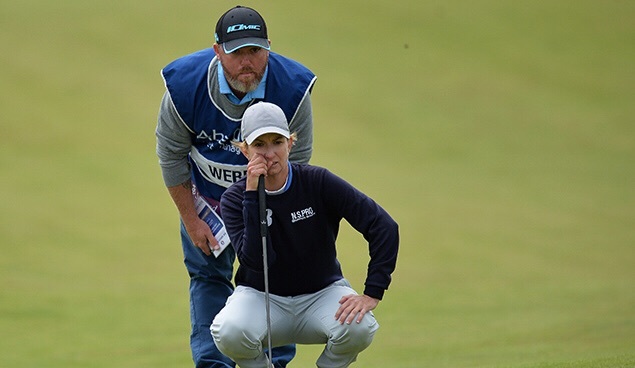 Webb, who had the lead or was close to the lead through three rounds, was overhauled by Mi Hyang Lee of South Korea on the final day. The 42-year-old will enter the Women’s British Open at Kingsbarns Links in Scotland next week on the back of some much-improved form, scrapping her way to tied-second in a week where the weather conditions were horrendous at times. The Australian shot a final-round 73, but was still two shots clear of the field through 14 holes after a chip-in eagle at the par-five 14th hole. But at the 16th she bogeyed, missing a short putt to save par, and at the par-four 17th she double bogeyed to surrender the lead. Webb had hit what she believed to be a good drive, but it ended in a fairway bunker. Webb’s ball was close to the face of the trap and she had to chip backwards, and then she found another bunker and made six. With Lee in the clubhouse at six-under par, the veteran required an eagle at the par-five 18th to force a playoff. She managed birdie, but missed out by a shot. She tied for second place with Mi Jung Hur of South Korea at five-under.